Newell Lodge and Resort at the Okefenokee Swamp is the ultimate destination in southeast Georgia for outdoor events. Whether you’re promoting a family, community or corporate event or promoting musical talent, we’ve got the right event space for you. At Newell, we offer the exclusivity and beauty of the area’s most exclusive resorts – but at a fabulous value event organizers and promoters appreciate. The spaces we offer for stand-alone event and occasion rental include the Gazebo, the Mainstage, the Pavillion, and Weekender RV Sites. Or, ask Kay Carter, our Southern hospitality consultant, about our customized wedding and event planning. Pair with catering and decor packages to arrange an exceptional experience for your guests and preferential pricing for your hosts. 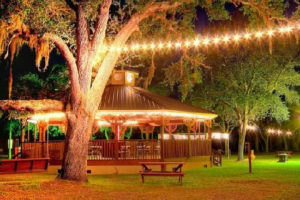 The perfect moss-draped live oak setting for an intimate Southern occasion, the Gazebo at Newell Lodge and Resort offers a hexagon-shaped bar, spacious dance floor, white tablecloth seating and buffet service for 90-100 guests. Your guests of honor can make a grand entrance from the front steps, or simply allow attendees to be swept along by the romance of it all: the cupola features Native American stained glass and overhead fans. Dim the overhead lights to enjoy understated twinkle lights that sparkle like fireflies. The 1200 square foot Gazebo is also handicapped accessible with attached restrooms. Whether hosting an Okefenokee Opry or a string quartet, our Mainstage takes its cue from classic rustic theater settings like Roger and Hammerstein’s “Seven Brides for Seven Brothers” or deMille’s “Appalachian Spring.” The wood floor is covered with indoor/outdoor carpet to muffle boot scoots. Insulated above to ensure sound quality, the generous 300 square foot stage area is framed by hewn porch rails which accentuate the natural surroundings. Like the old dog trot cabins of the region, the back steps lead to sitting porches. The stage offers three areas of ingress and egress and includes basic lighting and spotlights for headliners. Our *new* bathroom accommodations for stage event attendees also feature showers, making this the perfect venue for weekenders. Next up? Private green rooms for entertainers. Watch for those to be added in Fall 2018. *Coming Soon! * The Pavillion, an elevated take on the regional “pole barn” combines rustic simplicity with elegant appointments and vintage farmhouse charm. The promenade-style center room features vaulted ceilings with exposed rafters for almost 25 feet of temperature controlled space to accommodate 300-500 guests. To the right and left, traditional “lean-to’s” offer intimate spaces with half walls and double windows to let in the light. With a timeless look and feel, the Pavillion adapts to either dress up or dress down occasions. Crystal chandeliers sparkle above wooden floors throughout, while large fans circulate cool air to refresh guests at your party, reception or meeting. Throw open the double french doors at one end to reveal the Mainstage with your choice of entertainment. $1500 for 4 hours, including our on-site event manager to assist with set-up and decor, remain on standby during event festivities, and to help with break down. Event organizers and promoters who host a weekend event on our Mainstage should consider the option of including RV sites in their ticket prices. Behind the stage, we offer 108 pristine sites with electricity and water hookup. Both 30- and 50-amp sites are available; a dump station is located on the premises. For family organizers or corporate events, we also offer eight equally lovely 30- and 50-amp RV sites nestled between two of our cottages. If you’ve got folks coming from far and near to hang out together, this situation is exactly right, with electrical, water, and sewer connections. Unfortunately, all RV sites are for event purposes only. We are not an RV campground; the sites are not open to the public without a ticketed event reservation. Event promoters or organizers are assumed to be responsible for booking arrangements with the Lodge. We can recommend possible RV rentals if needed. We estimate guests can expect to pay $50/night for a 30-amp site, $60/night for 50-amp.